In Windows Vista, you had the ability to Run a program as an Administrator. But to run programs as a different / another user, you had to use the command line. In Windows 7 | 8 however, you can now perform both actions: Run as an Administrator or Run as different user, easily. Simply press Shift key and right click on the shortcut or executable you wish to Run as different user. 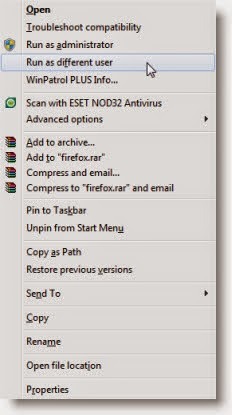 From the right click context menu, select Run as different. On Windows Server 2008 however, Shift + Right-click does not offer the option Run asdifferent user! It is offered in Windows 7 and Windows 8 too. It was also offered in Windows XP, but not in Windows Vista!